CLICK ON ONE OF THE PICTURES TO START THE PHOTO GALLERY! 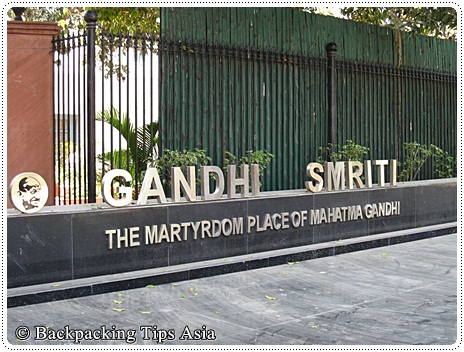 One of the attractions in Delhi you should visit must be the Gandhi Smriti Museum (must not be confused with Indira Gandhi Museum). For backpackers who are interested in Indian history should pay this wonderful museum a visit. Mahatma Gandhi is well-known for his non-violence civil disobedience (called 'ahimsa') and his role in India's fight against British colonial rule. First, I would like to start with some simple facts about Mahatma Gandhi's life and important pieces in the history of Gandhi. Mahatma Gandhi was a lawyer. He discovered the non-violent approach while he was working as a lawyer in South Africa. 1920s: During the early 1920s, Gandhi initialized a non-cooperation movement. He thought that if the Indians would refuse to work for the British, the British Government had to give in. Gandhi received support from the Congress and he co-operated with the Kalif (the Muslims). For both parties this co-operation and campaign was symbolically important since they constituted a united Indian front against the British. The campaign led to boycott of government offices, schools and British goods, demonstrations and mass meetings throughout the country. It was particularly working- and middle classes who were involved in the campaign. April 1930: Gandhi was let out of prison. He announced that we would leave his ashram and out to the ocean to manufacture salt. This was illegal since the British had monopoly on the manufacture and sale of salt, which was an important source of income. The Salt March was a PR stunt. It was followed by Indian and foreign journalists and film photographers. Through his act he emphasized the colonial power's lack of consideration to the Indian majority, who paid a great deal for the salt. Gandhi asked others to do the same deed - a civil disobedience. January 30, 1948: Mahatma Gandhi was shot dead while on his way to evening prayer ground at Birla House (now Smriti Museum) by Nathuram Vinayak Godse. Nowadays, India is divided into thousands of panchayats (local self-governing bodies). Panchayati Raj was a part of Gandhi's model of society. The Gandhi Smriti Museum was an excellent surprise for me and my former class mates. I thought it would be the typical 'show pictures and facts' type of museum, but half of the tour wasn't like that. The nice surprise was the Multimedia Museum on the 2nd floor of the house. The first thing visitors should do when they arrive at the museum is to walk around in the garden. You'll see foot steps following a path (imitating the last foot steps of Gandhi before he was shot). It's not allowed to walk in his foot steps! Along the far right of the wall, the history of Mahatma Gandhi begins. Take your time in reading this thing. I personally thought that the pictures were exciting. On your left side you will see the small pavilion where Gandhi was shot. Then go back again, and step into the house. There's an entrance to more pictures and facts about Gandhi, placed on pearl white walls. It was a pleasant exhibition explaining his life and what he did for the Indian population. You'll also get to see where he slept the weeks before he was murdered. You can return to where you started and to your left you will see a stair case leading to 2nd floor. That's the Multimedia Museum, and worth the trip! So many nice exhibits can be found on the 2nd floor. The museum presents the events of Gandhi's life through super modern technology. Where: 5 Tees January Marg. From 10.00 am to 05.00 pm. All days except Monday, and it's closed second Saturday of the month. 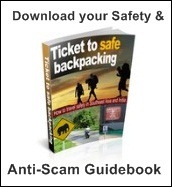 Looking for a guesthouse or hotel in Delhi?